How about we start a thread of dash pics to help people re-rigging or ordering new boats. 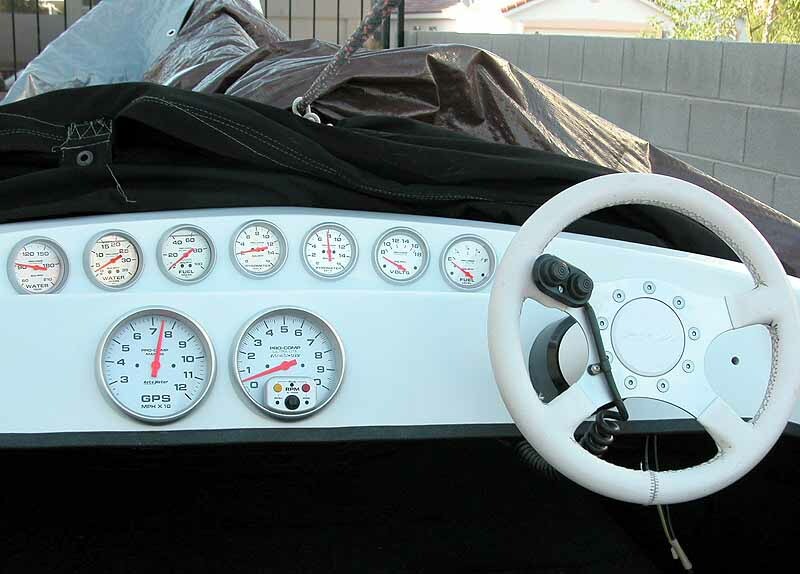 The gauges, high on dash is SS Marine lighted mechanical trim. They use a super bright LED as the pointer so it can be seen on sunny days. Water pressure, 2 temp gauges(one for each cylinder head), depth sounder, fuel, volt, RPM recall. And the lower is RPM and Speedo. Larry, how do you like your trim guage up there? Here's mine. Kind of simple and blah. Looking to re-do with Livorsi monster guages this winter. Also adding a stainless marine trim guage and dual digital EGT. Just need to figure out the best place to put them and decide what I want for face color and rim. Well, here's a few I have collected. Won't really help many people on gauge choices but maybe for burying the ugly blockies? fuel tank- water depth- switch panel- engine gauge- empties are bow angle and trim- to be replaced? The engine gauge has user settable high and low alarm points. Reads all engine functions and displays 6-7 items on one screen. Or 3 with labels. The speedo has max speed. The fuel and depth are also alarm gauges. Procomp, I got a disease. A very very baaaaad disease. New Euro, GPI rigged. For sale in Fargo, ND.